Cut a piece of beading string around one meter long. Add two white and one blue beads on the middle of the string, crisscross both string through one white bead, shown where both arrows exits from. Add two blue beads on the top (red) string, add one white bead on the bottom (black) string and crisscross this string through the last blue bead added on the top string. Add two white beads on the top (black) string, add one blue bead on the bottom (red) string and crisscross this string through the last white bead added on the top string. Add one blue and one white beads on the top (red) string, crisscross the bottom (black) string through the last bead added. (Working on only one side of the string on this step) Add two white, one gold and one blue beads on the right (black) string, crisscross this same string back down through the first white bead added on this step. Add two blue beads on the bottom right (black) string, crisscross the top left (red) string (which you did not use in step 5) through the last bead added. Continue to pass the black string (the one you just used to add new beads on) through one old bead from step 3 marked with A. Add two white beads on the bottom right (red) string, crisscross the top left (black) string through the last bead added. Continue to pass the red string (the one you just used to add new beads on) through one old bead from step 3 marked with A. Add two blue beads on the bottom right (black) string, crisscross the top left (red) string through the last bead added. Add one white, one gold and one blue beads on the top (red) string and crisscross the other end of the string through the last bead added. Add one gold, one white and one blue beads on the left (black) string and crisscross the right (red) string through the last bead added. Continue to pass the black string (the one you just used to added new beads on) through one old bead from step 11 marked with A. Add one blue and one white beads on the bottom left (red) string and crisscross the other end of the string through the last bead added. Continue to pass the red string (the one you just used to added new beads on) through one old bead from step 10 marked with A. Add one white and one blue beads on the bottom left (black) string and crisscross the other end of the string through the last bead added. Continue to pass the black string (the one you just used to added new beads on) through one old bead from step 9 marked with A. Continue to pass the red string (the one you just used to added new beads on) through one old bead from step 8 marked with A. Continue to pass the black string (the one you just used to added new beads on) through one old bead from step 7 marked with A. Continue to pass the red string (the one you just used to added new beads on) through one old bead from step 6 marked with A. Continue to pass the black string (the one you just used to added new beads on) through one old bead from step 5 marked with A. Add one gold and one blue beads on the top right (black) string and crisscross the other end of the string through the last bead added. Add two white beads on the right (red) string, crisscross the left (black) string through the last bead added. Continue to pass the red string (the one you just used to add new beads on) through one old bead from step 19 marked with A. Continue to pass the black string (the one you just used to add new beads on) through one old bead from step 18 marked with A. Continue to pass the red string (the one you just used to add new beads on) through one old bead from step 17 marked with A. Continue to pass the black string (the one you just used to add new beads on) through one old bead from step 16 marked with A. Continue to pass the red string (the one you just used to add new beads on) through one old bead from step 15 marked with A. Continue to pass the black string (the one you just used to add new beads on) through one old bead from step 14 marked with A. Continue to pass the red string (the one you just used to add new beads on) through one old bead from step 13 marked with A. Add one gold and one blue beads on the top left (red) string and crisscross the other end of the string through the last bead added. Continue to pass the black string (the one you just used to added new beads on) through one old bead from step 27 marked with A. Continue to pass the red string (the one you just used to added new beads on) through one old bead from step 26 marked with A. Continue to pass the black string (the one you just used to added new beads on) through one old bead from step 25 marked with A. Continue to pass the red string (the one you just used to added new beads on) through one old bead from step 24 marked with A. Continue to pass the black string (the one you just used to added new beads on) through one old bead from step 23 marked with A. Continue to pass the red string (the one you just used to added new beads on) through one old bead from step 22 marked with A. Continue to pass the black string (the one you just used to added new beads on) through one old bead from step 21 marked with A. Add one gold, and two white beads on the right (red) string, crisscross the left (black) string through the last bead added. Continue to pass the red string (the one you just used to add new beads on) through one old bead from step 35 marked with A. Continue to pass the black string (the one you just used to add new beads on) through one old bead from step 34 marked with A. Continue to pass the red string (the one you just used to add new beads on) through one old bead from step 33 marked with A. Continue to pass the black string (the one you just used to add new beads on) through one old bead from step 32 marked with A. Continue to pass the red string (the one you just used to add new beads on) through one old bead from step 31 marked with A. Continue to pass the black string (the one you just used to add new beads on) through one old bead from step 30 marked with A. Continue to pass the red string (the one you just used to add new beads on) through one old bead from step 29 marked with A. Add one gold, one white and one blue beads on the left (black) string and crisscross the other end of the string through the last bead added. Continue to pass the black string (the one you just used to added new beads on) through one old bead from step 43 marked with A. Continue to pass the red string (the one you just used to added new beads on) through one old bead from step 42 marked with A. Continue to pass the black string (the one you just used to added new beads on) through one old bead from step 41 marked with A. Continue to pass the red string (the one you just used to added new beads on) through one old bead from step 40 marked with A. Continue to pass the black string (the one you just used to added new beads on) through one old bead from step 39 marked with A. Continue to pass the red string (the one you just used to added new beads on) through one old bead from step 38 marked with A. 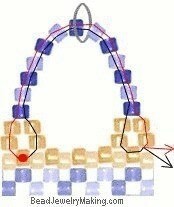 (Working with only one side of the string on this step - red) Add two blue, one gold and one white beads on the right (red) string and crisscross this same string down through the very first bead added on this step. (Leaving the other - black - string alone). Add one white bead to crisscross both strings with. Shown with the two arrows crosses and exit from. Add two blue beads on the right (black) string, crisscross the left (red) string through the last bead added. Continue to pass the black string (the one you just used to add new beads on) through one old bead from step 50 marked with A. Continue to pass the red string (the one you just used to add new beads on) through one old bead from step 49 marked with A. Continue to pass the black string (the one you just used to add new beads on) through one old bead from step 48 marked with A. Continue to pass the red string (the one you just used to add new beads on) through one old bead from step 47 marked with A. Continue to pass the black string (the one you just used to add new beads on) through one old bead from step 46 marked with A. Add one white beads to crisscross both lines through. Shown where both lines crossed and exits from. Tie off and pass excess string back through the piece and cut away excess. 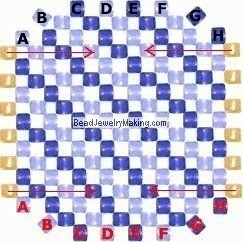 Now that you have a square, fold the piece in half matching the left gold beads with the right gold beads. The red alphabets will be a guide to the next step. Add one white and one blue beads on the top left (red) string and crisscross the other end of the string through the last bead added. Continue to pass the red string (the one you just used to added new beads on) through two old beads from marked with E and F.
Add one white bead on the left (black) string and crisscross the right (red) string through the last bead added. Continue to pass the black string (the one you just used to added new beads on) through one old bead marked with G.
Add one white and one blue beads on the top right (black) string and crisscross the other end of the string through the last bead added. Continue to pass the black string (the one you just used to added new beads on) through two old beads marked with A and B. Add one white bead on the right (red) string and crisscross the other end of the string through the last bead added. Continue to pass the red string (the one you just used to added new beads on) through one old bead marked with A. Add one gold and one blue beads on the left (red) string and crisscross the other end of the string through the last bead added. Continue to pass the red string (the one you just used to added new beads on) through two old beads marked with A and H.
Add one gold bead on the right (red) string and crisscross the other end of the string through the last bead added. Continue to pass the red string (the one you just used to added new beads on) through one old bead from step 63 marked with A. Continue to pass the left red string through one old gold bead marked with A. Pass the right black string through one old gold bead marked with A. Add one gold bead in between each old gold bead row on both sides of the beaded square. A total of five beads on each side. Continue to add two more gold beads on the right (black) string, crisscross the other (red) string through the last added bead. Add beads on the other side of the beaded bag just like from step 59 to step 64, tie off and pass the excess through the piece. 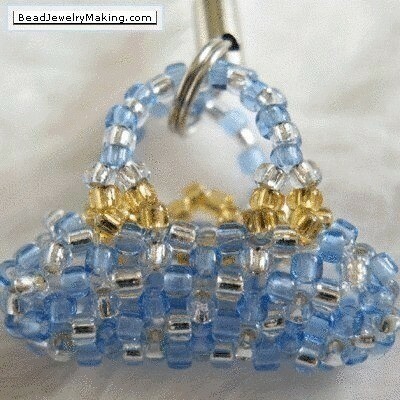 Cut a short piece of string, pass the string through one of the corner gold bead that you just added on step 66. Continue to add two gold beads on each side of the string, followed by adding 13 beads of alternate color of blue and white. (remember to add a charm hook or ring too). Split the two lines and add two gold beads on each side of the string, pass one end of the string through another gold bead from step 66 on the other corner of the beaded bag. Tie off and pass the excess back through the piece. Repeat this for the other side of the mouth of the beaded bag.